Rhabdomyosarcoma (RMS) is the most common soft-tissue sarcoma in the paediatric age group, ranking fourth in frequency after central nervous system tumours, neuroblastomas and nephroblastomas. Embryonal RMS of the biliary tree is considered a rare entity, with the most common clinical presentation being that of obstructive jaundice. We present the case of a 4-year-old boy who presented with hepatomegaly and obstructive jaundice. Biochemically, there was evidence of elevated ductal enzymes with conjugated hyperbilirubinaemia. 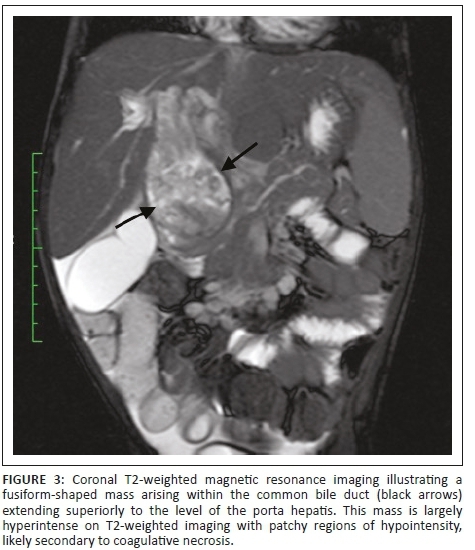 The magnetic resonance imaging (MRI) features were consistent with a biliary RMS with the differential diagnosis of a choledochal cyst initially included based on the computed tomography images. The diagnosis of embryonal biliary RMS was later confirmed on histology. This case illustrates the importance of considering malignant aetiologies in paediatric cases of obstructive jaundice, as this entity is infrequently described in the literature and may mimic the appearance of a choledochal cyst. The demonstration of enhancement of intraductal material within the biliary tree on MRI and the presence of arterial waveforms within the intraductal mass on ultrasound assists in the differentiation between biliary RMS and a choledochal cyst. 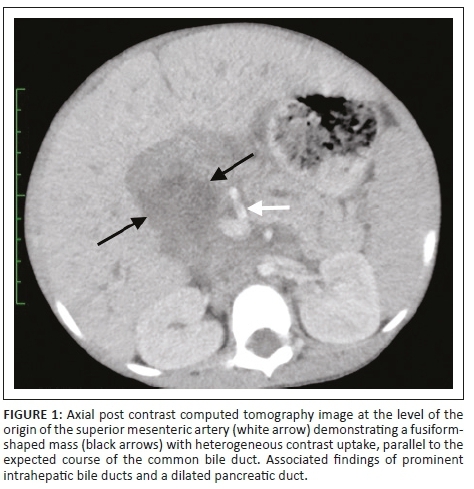 A 4-year-old boy presented with a 3-month history of yellow discolouration of his eyes, dark urine and pale stools as well as a 2-month progressive history of abdominal distension. On physical examination, he was pale, had scleral icterus and the abdomen was distended with a large palpable liver. On the day of his admission, serology revealed elevated liver ductal enzymes with conjugated hyperbilirubinaemia, an elevated international normalised ratio (INR) and iron deficiency anaemia. The abdominal ultrasound (US) demonstrated a heterogeneous periportal mass with internal flow on colour Doppler and associated dilatation of the common bile duct (CBD), cystic duct, gall bladder and intrahepatic bile ducts. A computed tomography (CT) scan of the abdomen and pelvis with an intravenous and oral contrast agent showed a large (60 mm × 45 mm × 89 mm), fusiform-shaped mass with heterogeneous contrast uptake, parallel to the expected course of the CBD (Figure 1), with the superior aspect not separable from the adjacent porta hepatis or proximal central bile ducts (Figure 2). 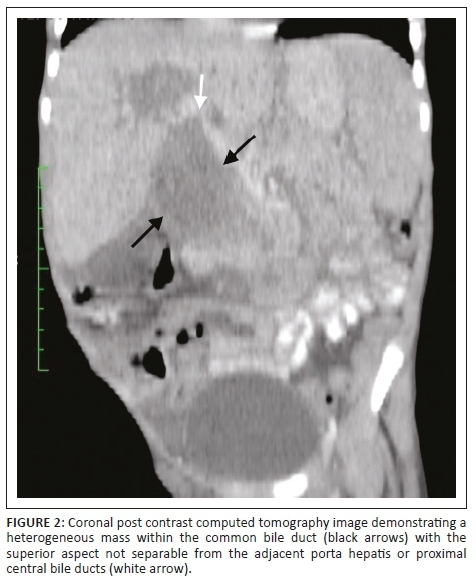 The portal vein was partially attenuated with no evidence of tumour thrombosis. The medial border of this mass was separable from the pancreas, with the lateral border deviating and partially compressing the D1 and proximal D2 segment of the duodenum with no features of bowel obstruction. Inferiorly, the mass extended just below the inferior pole of the right kidney. The aorta was slightly displaced to the left but not attenuated and the inferior vena cava (IVC) partially attenuated with no tumour thrombus. There was secondary diffuse intrahepatic bile duct dilatation and marked dilatation of the gallbladder and cystic duct. The pancreatic duct was also dilated throughout its course. Ascites was present and there was no evidence of metastases to the liver, lung or visualised bone, but associated enhancing para-aortic and mesenteric nodes were noted. The prostate gland, scrotal sac and contents were normal. Magnetic resonance imaging (MRI) of the abdomen and magnetic resonance cholangiopancreatography (MRCP) with contrast were of added value in better delineating the origin and extent of the mass already suspected of being bile duct in origin on CT. The lesion filled the dilated CBD (Figure 3) and demonstrated asymmetric mural thickening of the CBD (Figure 4). There was associated dilation of the gallbladder and a small calculus was noted within the dilated cystic duct (Figure 4). The contrast-enhanced MRI demonstrated heterogeneous enhancement within the solid components of this mass. 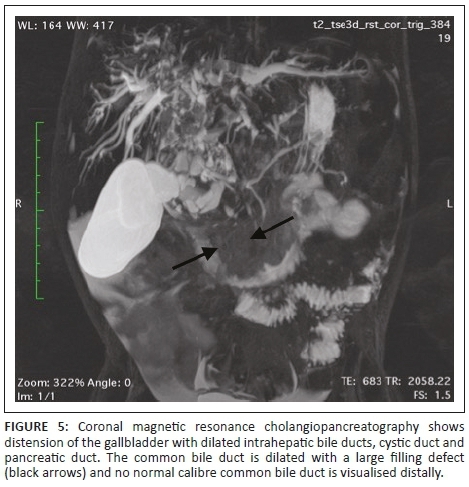 Magnetic resonance cholangiopancreatography illustrated a dilated CBD with a large filling defect as well the previously noted findings of dilated intrahepatic bile ducts and pancreatic duct (Figure 5). The MRI features were consistent with a biliary RMS with the differential diagnosis of a choledochal cyst initially included based on the CT images. The patient was taken to theatre where the ascites was drained and the peritoneal cavity inspected. A solid heterogeneous mass was found within the dilated CBD. In addition, there was a periportal lymph node mass as well as peritoneal wall deposits. Multiple tissue biopsies were sent off for histopathological evaluation. Microscopy confirmed the presence of a high-grade malignant tumour consisting of primitive mesenchymal cells of varying phases of myogenesis with a variable content of rhabdomyoblasts. The immunohistochemical features were in keeping with embryonal RMS with positive stains of Periodic Acid-Schiff (PAS), desmin, myogenin and myoD1. There were representative sections that showed that the tumour infiltrated into the fibrovascular connective tissue as well as evidence of angiolymphatic infiltration. Perinodal soft-tissue extension was noted; however, no biliary mucosa was present for assessment. The immunophenotypic features were in keeping with embroyonal RMS with the probability of bile tract origin based on imaging and intraoperative findings. The patient then received post-operative chemotherapy and was initiated on cycle 1 of the VICE protocol which included vincristine, isosfamide, carboplatin and etoposide. Unfortunately, a few days after initiating treatment, the patient became very ill in the ward. His abdomen became very tense and distended which caused splinting of the diaphragm. He subsequently developed respiratory distress and demised. Biliary RMS is a rare entity but should be included in the differential diagnosis of any child presenting with obstructive jaundice.9 Imaging plays an important role in the diagnosis and management of this malignancy as well as in differentiating it from a choledochal cyst. The prognosis and long-term survival of biliary RMS has improved with advances in surgery, radiotherapy and chemotherapy. D.M. was responsible for the review of literature, review of the imaging studies as well as the write-up and preparation of the case report as per journal requirements. H.D.L. (intern) compiled the clinical and surgical notes, imaging reports and histology results. N.M. was responsible for the diagnosis of the case, interpretation of the imaging studies and editing of the final article. D.M. and H.D.L. share joint first co-authorship.